We are back at it! MidwestHR has completed our second event for the year just following the very successful tie-blanket project. 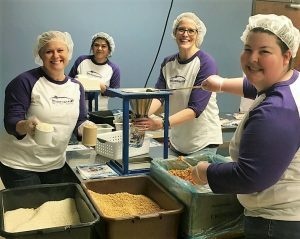 We had several volunteers make their way over to Feed My Starving Children on February 23rd at their Aurora, IL location. Feed My Starving Children (FMSC) is a Christian based non-profit organization that has volunteers and donors help supply and pack food packets for families around the world that do not have access to the food they need to survive. Humanitarian organizations partner with FMSC to then distribute the meals to children and families through orphanages, schools, clinics, refugee camps and nutrition programs. Mayra, Rebecca, Michelle and Lisa put their MidwestHR 180 Initiative shirts to work when they helped pack food packs for starving and malnourished children. During their 2-hour packing session, they were able to help pack 234 boxes of meals. That is equal to 50,554 meals to feed 138 kids for an entire year! We could not be happier with the work they did to help children around the world receive life-saving food at such crucial times in their lives. We hope to continue the work with FMSC throughout the years to help forward the positive impact they are making in the world today. Check back next month to see what else the MidwestHR crew is doing to give back to our community. Previous Post: « First 180 Initiative Event of 2018 for MidwestHR!